A teacher taught hundreds of children but to make a difference to a child’s life was a blessing. Those were the words of Overport SRS Primary teacher Hamraaz Ally after she won the Woolworths KZN teacher who made the difference award on Monday. The day also marked national teachers’ day. Ally was nominated by her Grade 3 pupil Sindiswa Ndhlovu, 8, who wrote a touching story on how Ally positively influenced her life. Ally has been her teacher for the past three years. She has 34 other pupils in the class. Ndhlovu lost both her parents at the age of two and regards Ally as a mother figure. She is living with her gran, Margaret Ndhlovu, and her cousins in the Durban CBD. “She taught me to read, write, have respect and be happy. My teacher taught me to stop fighting and hating other people. Ally helped me to feel special. She gave me stationery and clothes. “She is the one that notices when I am not well and makes sure that she phones my granny or writes to her. Earlier this year I had a headache and my speech was affected. My face was losing its shape and my granny never noticed this. When I arrived at school Ally noticed and told my granny to take me to the doctor immediately. To enter the competition, pupils were asked to write a letter of 200 words. 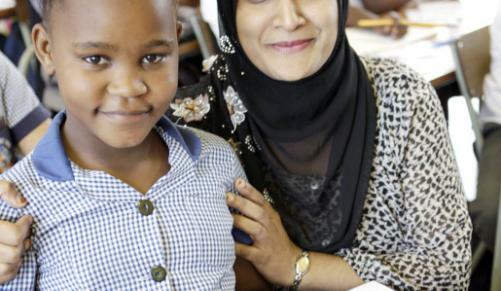 SRS school co-ordinator, Vigie Pillay, said there was a total of 1 000 entrants. Ndhlovu won a R2 000 Woolworths voucher while Ally received a laptop and a R5 000 voucher. The school received R5 000 for producing the winning pupil. Two prizes were awarded in each region. Congrats to the student who won this computer! So happy for you! Praise to this amazing and inspirational teacher.